Faithful followers will know that I was really looking forward to this films release. No doubt they will also have noticed the lack of review on this site. The inconvenience of having a full time job mean that I never got to see Parnassus in the cinema, but the epic rain that washed out the Bank Holiday weekend allowed me to finally get around to watching the DVD. Let’s get the obvious bit out of the way first. Yes, it’s weird. In fact it’s very weird. But this is the mind of Terry Gilliam, where if you think it makes sense, you’re not getting it. So put that aside before you start and you’ll get on a lot better. Gilliam is essentially an artist, and it’s the visuals that make this film. Each trip through the Doctor’s magic mirror takes us into a world beyond imagination that only Gilliam could create. But unfortunately it has little else to offer. I did enjoy the juxtaposition between the old-fashioned world of the Imaginarium and the modern world of it’s clientelle. The opening credits set you up for a period piece, but then a drunk guy wanders into shot from a nightclub and you realise you’re expectations were wrong. Just how Terry likes it. I don’t want to call Parnassus a bad film, because it isn’t bad exactly. But I’m not sure what it is. The plot is as expected; convoluted and very hard to follow, but if you strip it down to the bare bones it’s actually relatively simple. The problem is the characterisation. I’m not really sure whose side we’re supposed to be on. There isn’t really a protagonist story to follow, the plot just seems to meander around a group of people. As for the actors behind the performances, Tom Waits does a great underworld Mr Nick and Verne Troyer proves he can do more than just be the funny little guy in his first proper acting role. The focus however, falls inevitably on Heath Ledger. This is where it gets difficult. 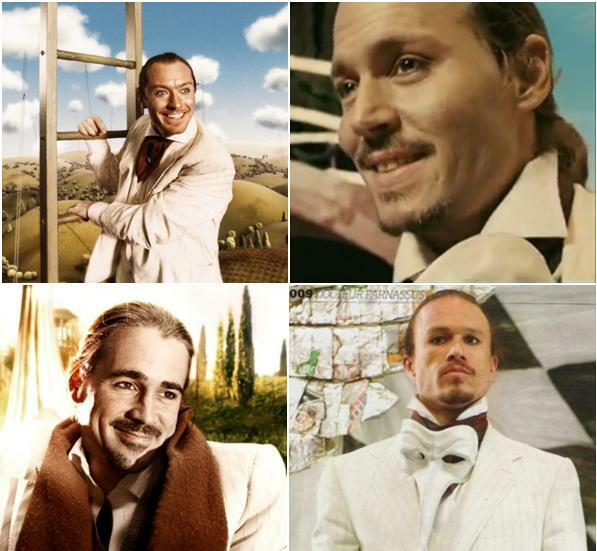 Neither Ledger, nor alter egos Johnny Depp, Jude Law and Colin Farrell, really get to stretch their acting muscles. If anything, the only thing that caught my attention was Ledger’s wandering accent, which never seemed to get hold of a region (Farrell on the other hand carried off an impressively non-Irish dialect.) It’s a shame to have four huge talents like that on screen and see them go to waste, but to be honest not many members of the cast get to do much. The eponymous Dr Parnassus (Christopher Plummer) spends most of the time asleep, and it’s hard to keep up with who bet what to who and why. I’m still not actually sure who won. Lily Cole and Andrew Garfield are good though as Valentina and Anton. In fact, Garfield wins the prize for being the only character I actually cared about. I’m so reluctant to criticise this film. Not only because it is Heath’s last, but because it had potential to be really good. Wishful thinking can’t rescue a film though, and I’m afraid I have to confine Dr Parnassus to the missable movies vault. Maybe watch it once just to say you’ve seen it, but I fear that without the macabre draw of this being a film where the lead actor died during filming, few people would have given it the time of day. Today is the premiere of one of the most eagerly anticipated films of the year: The Imaginarium of Dr Parnassus. I really hope it lives up to the hype, because with a cast like that and Terry Gilliam at the helm it’ll have to work hard to go wrong. Of course, there’s gonna be a lot of the same cautious criticism that there was with Dark Knight, and again there will be a significant proportion of the audience who wouldn’t have bothered to turn out to the cinema in different circumstances, but I’d like to think that the movie should be able to earn praise in its own right. It definitely looks like it’s gonna be one amazing ride.